As some of you know, I program the films screened every year at the Windy City Pulp and Paper Expo. With 2013’s convention beginning just eight weeks from today, I thought now might be an opportune time to reveal the titles. The Film Room lineup is generally pegged to each show’s theme, and this year’s Windy celebrates both the 90th anniversary of Weird Tales and the centennial of Fu Manchu, whose exploits first appeared in book form in 1913. Below are the movies and TV episodes scheduled for the viewing pleasure of those fans attending on Friday. The Saturday offerings will follow in my next post. 12:00 — Drums of Fu Manchu (1940), Part One. 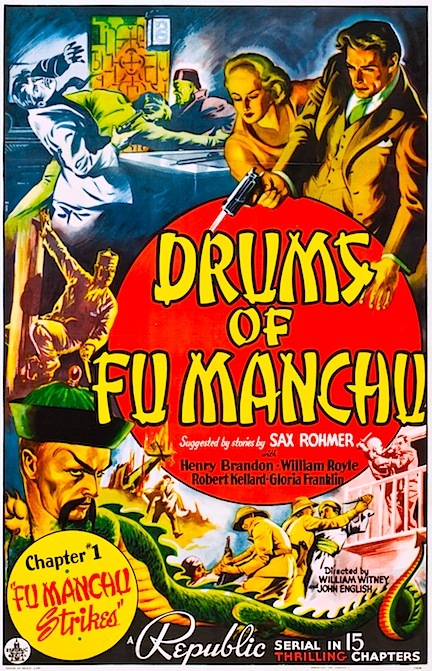 The screenplay for Republic’s 15-chapter serial did not adapt Sax Rohmer’s book bearing the same title; instead it pilfered elements from the entire series, with a special emphasis on Mask of Fu Manchu. Reflecting the studio’s large investment in character rights, Drums was more generously budgeted, and given a longer shooting schedule, than Republic’s previous chapter plays. Added care was taken in scripting, casting, direction, and photography, resulting in what many believe to be the very best of the fabled Republic serials—an opinion shared, incidentally, by its co-director, William Witney. Henry Brandon is ideally cast as Rohmer’s Devil Doctor and character actor William Royle, while not physically suited to the role of Nayland Smith, delivers what is certainly the finest performance of his mediocre career. We are proud to offer a unique presentation of this classic Fu film: a specially prepared feature version, broken into two parts, mastered by us from the only surviving 35mm print struck from the original camera negative. As the print was incomplete, our cut necessarily interpolates some footage from lesser-quality material, and the juxtaposition of sources will prove strikingly illustrative to those who’ve only seen inferior video editions released previously. Another Windy City exclusive! 02:00 — Pigeons from Hell (1961). In addition to the Fu Manchu centennial, this year’s convention celebrates 90 years of Weird Tales, “the Unique Magazine,” which retains its popularity among readers and collectors of classic pulp fiction. In its heyday Weird Tales failed to attract Hollywood filmmakers, who presumably found most of its fare too outré for mainstream audiences. Only a couple yarns from the magazine made their way to the silver screen before 1960; we showed one of them, Fiend Without a Face, a few years back. Weird Tales was far better represented on the small screen, and this weekend we’ll be revisiting some of the best TV versions of popular stories that debuted in the pulp. This 1961 Thriller episode marks Hollywood’s first attempt at adapting Robert E. Howard. Originally published in the March 1938 issue of Weird Tales and called “one of the finest horror stories of the century” by Stephen King, Pigeons from Hell unfolds in and around an old mansion said to be cursed by a malevolent entity. Boris Karloff hosts the episode, which stars Brandon De Wilde and Crahan Denton. 03:00 — Daughter of the Dragon (1931). Having ignored his most famous character for more than a decade, Sax Rohmer was induced to revive the Devil Doctor at least partially in response to Paramount’s widely successful 1929 talkies, The Mysterious Dr. Fu Manchu and The Return of Dr. Fu Manchu, starring a pre-Charlie Chan Warner Oland. By virtue of its previous contract with the author, Paramount retained right of first refusal to the novel that followed, Daughter of Fu Manchu (1930), and promptly optioned the property. However, writer-director Lloyd Corrigan and his fellow scenarists jettisoned Rohmer’s plot and substituted one furthering the revenge scheme that animated the previous two films. Fu’s daughter, Fah Lo Suee, became Ling Moy, and the Doctor himself was killed off early in the proceedings. Nayland Smith was nowhere to be found, the cause of justice being represented by Chinese secret service agent Ah Kee. Rohmer purists are justified in denying Daughter of the Dragon admission to the canon, but the movie is quite engaging in its own right and certainly follows the melodramatic tradition of the author’s best works. Moreover, it’s a good showcase for early Hollywood’s two prominent Asian-American stars: Anna May Wong and Sessue Hayakawa. 04:30 — The Phantom Farmhouse (1971). Back in the day, Seabury Quinn was the favorite author of many Weird Tales readers, and he was perhaps the most prolific as well. Strangely, his adventures of Jules de Grandin—some of which might have made dandy little “B” horror movies—were overlooked by Hollywood. The first of his yarns adapted to film was also his first published in Weird Tales (in the October 1923 issue, to be precise). The Phantom Farmhouse was broadcast early in the second season of Night Gallery, Universal’s well-regarded series of supernatural stories. David McCallum plays the psychiatrist who comes under police questioning when one of his patients is found murdered under mysterious circumstances. Orson Welles, no stranger to dramas of this type, is the narrator. Immediately Following Auction — The Mask of Fu Manchu (1932). Most Rohmer fans believe this florid melodrama to be the best film featuring Fu Manchu. And it’s hard to make a case to the contrary. The adaptation of the similarly titled novel (already written but not yet published when M-G-M purchased screen rights) hews fairly closely to the source, and the cast is nothing if not noteworthy. Grotesque makeup notwithstanding, Boris Karloff is superbly sinister as the Devil Doctor, Myrna Loy (then typecast as Oriental temptresses) suitably alluring as Fah Lo Suee, Lewis Stone stolidly dependable as Nayland Smith, and future cowboy star Charles Starrett properly heroic as Terry Granville. For many decades after its theatrical release Mask of Fu Manchu was available only in a politically correct version that deleted numerous racially insensitive epithets uttered by the white cast members. Troublemakers that we are, our print restores the offending remarks in all their anti-Yellow Peril glory.